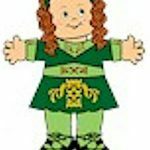 To get started on your Leprechaun Buddies Paper Dolls, print out your favorite buddy paper doll and leprechaun costume in black and white or color . If you are using the black and white version, have the kids color the buddy and clothes before they cut them out. It makes it much easier. Cut out your leprechaun clothes and glue to your favorite buddy paper doll.